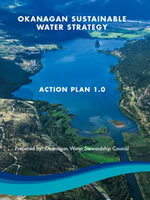 In October 2008, the Okanagan Water Stewardship Council released the Okanagan Sustainable Water Strategy, a comprehensive guide to water management practices that will help us adapt to changing climate and rising water demand and work toward long-term water sustainability in the Okanagan Basin. The Strategy was developed at the request of the OBWB Directors, who asked for a document that would bring together information about Okanagan water issues and make recommendations about how these issues should be addressed. The Council and external reviewers devoted thousands of hours in preparation of the Strategy. Their findings, conclusions, and recommended actions are based on a remarkable degree of consensus among all participants. The Strategy brings together extensive technical information about the Basin and highlights the most important water management issues and how they connect to one another. The Strategy includes recommended actions designed to protect water at its source, share water in times of shortages, manage water demand, and identify the best structure for valley-wide governance. Having all of this information laid out and explained in one document means that the Board can act on those recommendations that match their current priorities and capacity. To achieve successful and timely implementation, the Strategy will need a coordinated effort from regulators, practitioners, and residents. We encourage you to become familiar with the Strategy and to be an advocate for the implementation of its actions. Please contact Nelson Jatel at [email protected] or 250-469-6295 to order a hard copy. 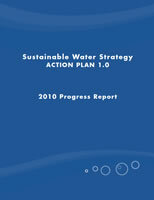 The Sustainable Water Strategy was released in 2008 by the Okanagan Water Stewardship Council (with approval by the Okanagan Basin Water Board) after almost three years of planning, discussion, consultation, and writing. The purpose of the Strategy was to identify the most-pressing issues facing water resources management in the region and to suggest how and where concrete action could be taken. It was intended to serve as a ‘call to action’ and to point us in the right direction without actually anticipating or prescribing how we might get there. There was always the realization that progress toward a more sustainable water future would depend critically on the engagement of all stakeholders, and it was anticipated that everyone would do what they were able, no matter how small the action. It is now more than two years since the release of the Strategy, and many have wondered what actions have been taken and to what degree the Strategy is still relevant. This report provides a comprehensive update on what has transpired since 2008, and we are delighted to conclude that the Strategy is still very relevant. As you take a few moments to look through this progress report, we hope you will be as impressed as we were by the range of activities that have been undertaken and by the successes we have enjoyed as a community. We hope you will also reflect back on the Strategy and ask yourself what you and your organization could do to help out (thanks to those that are already heavily involved!). And finally, we hope that you will begin to ponder the question of ‘where to next?’ The ongoing provincial Water Act Modernization process provides a splendid back-drop against which to realize our collective goals and to institute substantive changes that will take us farther down the path toward a sustainable water future. 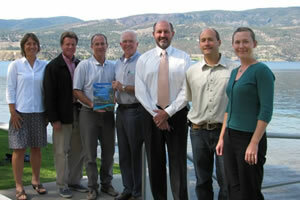 The Water Stewardship Council and the Okanagan Basin Water Board continue to work diligently to realize this goal.